Layer the magical ingredients and refrigerate overnight for this Mexican Salad. Enjoy south of the border flavors in this Mexican salad. Layer lettuce, beans and tomatoes in large bowl. Mix salsa and sour cream until blended; spread over salad to edge of bowl. Sprinkle with cheese and onions. Refrigerate several hours. Sprinkle with chips just before serving; toss lightly. 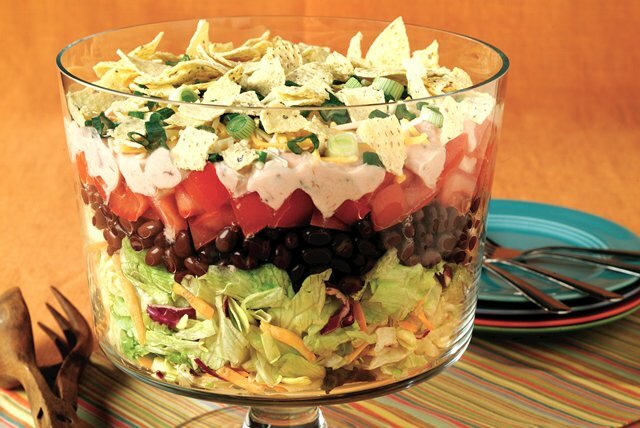 Show off this colorful layered salad by serving it in a clear glass bowl.